In 1984 the National Union of Mineworkers went on strike. The dispute lasted for over a year and was the most bitterly fought since the general strike of 1926, marking a turning point in the struggle between the government and the trade union movement. The Orgreave coking plant was the site of one of the miners' strike's most violent confrontations. It began in a field near the plant and culminated in a cavalry charge through the village of Orgreave. 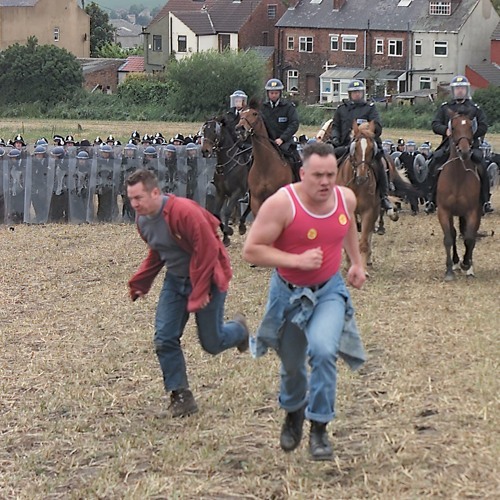 Jeremy Deller’s The Battle of Orgreave, staged seventeen years later, was a spectacular re-enactment of what happened on that day. It was orchestrated by Howard Giles, a historical re-enactment expert and the former director of English Heritage’s event programme. More than 800 people participated in the re-enactment, many of them former miners, and a few former policemen, reliving the events from 1984 that they themselves took part in. Other participants were drawn from battle re-enactment societies across England. In this recording Stephanie Gregory reads a poem, Chanting, and leads a chant as was heard during the miners' strikes with police.